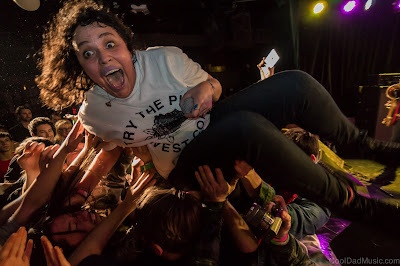 DOWNTOWN BOYS: Dubbed "America's most exciting punk band" by Rolling Stone, Downtown Boys is a self-described "bilingual political dance sax punk party" from Providence, Rhode Island. They are known for their electric, politically charged performances, which take the audience on a frenzied tour through history, from the slave trade to police brutality today. A Hartford Courant reviewer wrote, quote, "You can make the case and people have that Downtown Boys ... was the sound of punk rock in America in 2015." The reviewer compared their performances to, quote, "anarchic backyard barbecues part political rally, but all danceable, kinetic party; thrash around, if you want, but pay attention." - Amy Goodman host of Democracy Now! Dangbats (just added to the show! ): Dangbats are Lys Guillorn of Lys Guillorn and Her Band (vocals, guitar, banjo, lap steel) and Joe Russo of SPECTRAL FANGS (vocals, guitar, banjo). Their genre? Bat Country, of course. Some of the artists they like are: Louvin Brahs, The Cramps, The Damned, The Carter Family, and Johnny Cash. You can see their Tiny Desk Concert submission here. REDUCTION PLAN: Dan Manning has played Willimantic Records several times as a member of the outstanding UCONN rock bands COP and CONDITION. Towards the end of 2015 he began gigging out with a solo project he calls REDUCTION PLAN, a fantastic mixture of ambient fuzz and dream pop, swirling melodies with unobtrusive hooks layered over a warm hum, created with looped guitars and various electronic gear and gizmos. The first REDUCTION PLAN performance at Willimantic Records was stunning, and the second, somehow, even better. Do not miss REDUCTION PLAN on the 19th at 750 Main. Dan is likely on first, so get there early. Listen to REDUCTION PLAN here. THE SHRINNIRS - Willimantic based duo playing on and off (mostly off) since the mid-1980s. Plenty more to read about the Shrinnirs on their tumblr web log here. The wonderful MAL DEVISA was originally part of this bill. Due to a scheduling conflict, she will not be able to perform in Willimantic on the 19th. Concert takes place next door to Willimantic Records at 750 Main. An all-ages show with cash bar for those 21 and over. Advance tickets available for $7.00 at Willimantic Records (cash only). Tickets also available online thru Brown Paper Tickets (credit card). Will-call Brown Paper Tickets should be picked up the evening of the show at Willimantic Records, which is located next door to venue. Parking is located in the back of the building on Riverside Drive.